Had a blast reading at the Pinney Mini Book Fest on Saturday. It was mini, indeed, but I love the feeling of Madison events—that sense that there’s a heck of a lot of interesting thinking going on beneath a homey Midwestern surface. I indulged myself by reading one of the alternate openings for The Halcyon Bird, and my audience rewarded me with their rapt attention. I met some pleasant and funny local writers, including Tina Azubuike Osuocha, West African chef, Angie Stanton, YA romance author, and Anita Klumpers, romance writer and professional grandmother. I love reading aloud. Doesn’t matter if it’s my work or not, though I do deeply enjoy re-interpreting my work and doing all of the accents. I remember the first time I read the opening chapter of The Demon Catchers of Milan, and heard gasps at the final line. I knew I was onto something. If it’s new work, I bring a pencil and mark where I lose folks—and tell them as I do so, which (at least for me) seems to increase our sense of connection. It certainly gets a laugh. The Internet is a grand ampitheatre for our minds, but I love straight human interaction, all of us breathing in the same place together, syncing up our heart rates and our moods like the good mammals we are. But then that’s me: no doubt descended from cave people who sat out in front of their grotto cracking nuts and honing adzes and talking to every soul that passed by. The pioneers in my family tree probably built their front porches first. Readings can be another way of sitting around passing the time of day and telling stories—a bit more formal and one-way, granted, but still pleasant for all concerned if you’re doing it right. Here’s to being human and reading books! Can’t thank you enough for being part of the Pinney Mini (hereafter to be referred to as The Best Day at the Library, Ever). 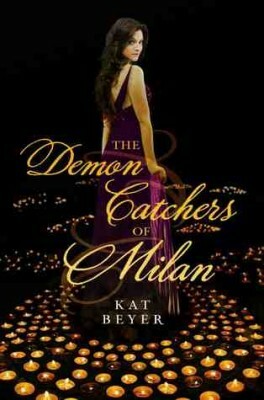 I just finished The Demon Catchers of Milan this morning – my children suffered terrible neglect while I read it. Thank you! Hope your kids are OK! That day was indeed fabulous, and I would love to be involved in more. Sounds like you liked the book; so glad! Here’s to the next one being even better.